How much leftover fabric do you have? Thread: How much leftover fabric do you have? These days I am busy with cleaning up my sewing room. I bet, here is one or two or more who knows, what it means. So, what about you? How much leftover fabric do you have? Is it more than your unused fabric? Is it balanced? Do you keep every little piece? I only have leftover scraps. I never buy fabric until I'm ready to start the quilt. I just don't want to end up with a huge stash of fabric. Too much clutter makes me jittery. I am trying very hard to use what I have and NOT buy more. I have enough projects in the works that I could be busy for a long enough time. And I will not start another new one until I finish at least 1 - so basically I guess you could say my UFOs won't be growing. Just staying the same. It depends on what you mean by leftovers. I have some fabrics that I bought specifically for a project. On some of these I have 'scraps' leftover. Some others I have 'yardage' leftover (fat quarter or greater). I have recently begun saving pieces left after trimming during paper piecing. I tried to make a 'scrappy' quilt using only my stash. I picked 4 colors - purple, aqua, orange and neutrals. I then started to make the blocks and realized that my neutrals and oranges all looked too similar in value/scale/color to qualify as scrappy. So I purchased approximately 10 - 1/2 yard pieces of both neutrals and oranges to enhanced the 'scrap' factor of the quilt. I love the results but it certainly did not reduce my stash. LOL! I find myself using my stash as a starting point for projects and then adding to it to complete. And the 'leftovers' continue to grow. Right now I think my stash is larger than my leftovers (but probably not for long). My leftovers outnumber the new/unused stuff, but I have been quilting since 1992, and in that time have purchased a lot of fabric, and made a lot of quilts. I don't have a lot of "leftover" fabric - I do have a stash though - I'm not sure where some of the fabric came from though - I must have had a vision when it was purchased but I've forgotten what it was! When I find a fabric I really like I try to buy enough to use in several projects. I really hate to have a fabric I love only to find that it is no longer available and then not have enough to do another project using it. So much of my stash is yardage that has been used in one or more projects already but hopefully there is enough for the next one I want to use it for. Just finished a quilt that I had to buy more of one of the fabrics twice. Third time I got 2 yards (only needed a few inches) so I would be sure to have some to keep. I have a nice size cupboard containing my stash and a milk crate of scraps. I used up a lot of scraps in my Spiderweb Queen size quilt for our bed. Bonnie Hunter's www.quiltville.blogspot.com has lots of free patterns for taming your scraps. Every year I tell myself I will get down to only one shoe box size of scraps.. and every year I make 3-4 full or larger size quilts and still have just as any boxes ( if not more) of scraps at the same time every year.. I have started using up my scraps, it is great fun!!!! 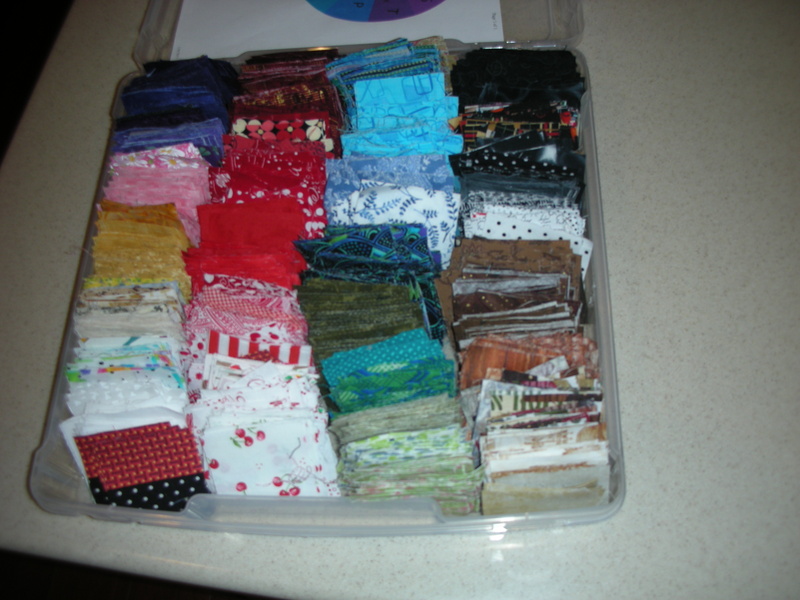 I want to do a scrappy PP quilt using a block called "Cracker", so I am going to go thru all of my stash cutting what I need, then what is left over I will cut into either a 10" or 11" sqs to do a couple of Karla Anderson "stack and whacks". But I will still have leftovers that I will have to store back away. Sigh, it's a problem. And that's not even doing anything with my several FQ collections, or the 80 FQs I got a couple of weeks ago from Keepsake Quilting end of summer sale. I'm confused.... I've always considered my leftover pieces of fabric as my stash. I have plastic shoeboxes with scraps (less than 1/4 yard) stored by color but anything 1/2 yard or more I considered my stash. I have a medium stash with lots of 2 yard pieces .... a few larger cuts. I try to use up my scraps for applique or PP baby quilts. They are even a good choice for some larger quilts. I usually plan quilts around what I have and then buy coordinating fabrics to finish up. But I buy enough that I'll have some to add to my stash and scraps. My stash has pretty much stayed the same size over the years..... works for me...... huge closets full of fabric would overwhelm me. What if the fabric I want to use is 1 yard short of what I need? I just couldn't do it that way. I have 3 twin sized quilts in various stages (none finished). They are all up to the blocks are made and ready to sew together. These are my projects for the summer. I have not bought any fabric for them except a couple of mystery boxes from Craftsy of 50 fat quarters for $58.00 each. I couldn't resist and I was not disappointed. I will use the fat quarters for donation quilts for Linus. My stash is getting smaller by the minute. This also gets 3 projects off my bucket list. LOL I know exactly what you mean! Today I found out that I have are two 50 gallon totes worth of left over fabric. I don't keep everything either. If there isn't enough space on the fabric to do anything applique wise, or if the fabric is less than 1/2" it gets tossed. It's been awhile since I've organized everything. I'm gonna have to get on that soon. My quilting table is getting ran over with new designs and fabric. Not to mention that my thread stash is starting to take a life of it's own. I've been so caught up in making quilting blocks, designs, and wall hangings lately that organizing has been left to the back burner. I don't have a stash because I buy what I need for each new project but I do have scarps left. So far I have been cutting them into 2.5 inch squares. By color, I think I have a picture from when I started. Now it encompasses 2 boxes, 13 X 13, very stuffed!!. I try to cut them when I finish the quilt so it does not get too overwhelming. What will I do with them? I'm thinking of the type of quilt where it starts in one corner with white and gradually finshes in the opposite corner in black. We'll see! Been letting my little niece play with the 1-1/2" strips. She measures where the 1/4" seam should be then sews. Bought some small thimbles so she could see which fit the best. We just initial hers so they don't get mixed but I gave her a tote for her sewing notions. If she wants to cut multiples, I supervise her closely when using the smallest rotary cutter. I make her put on an oven mitt to protect her opposite hand. I had a small hoop she takes home to practice embroidery and stitches. She's proficient on the computer. Youtube and Jenny Doan are her favorites. I have more than I like to admit. I am always afraid of cutting wrong (which I rarely do) so I usually buy more than what is needed for the patterns. I agree with you Marti. I have more projects that I will be able to complete in my lifetime. I save every little piece worth having or pass it along. I also get scraps from some one else or buy it up. New fabric is just too pricey. Fortunately I do like scrappy quilts. I am also trying to use what I have as much as possible. So far this year I have purchased one fat quarter and 5 yards of black fabric, plus one jelly roll and a yard and a half of coordinating fabric, and a couple of charm packs. Rhonda's Scrappy Mystery Train Ride used most of my leftover pieces. Most of the leftovers that remain are in extra yards purchased of my most frequently used fabrics. My stash continues to grow; however, I continue to use my stash on a regular basis and have successfully completed several projects this year using stash and leftovers. I have all kinds of leftovers and yardage. My stash is getting out of control. In addition to trying to finish my UFO's this year I am trying to use mostly just my stash. I am doing pretty good so far with this. 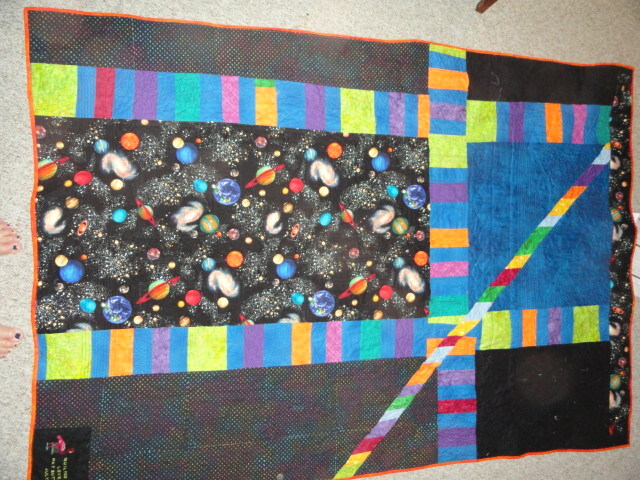 I have been not buying backing for my quilts lately. I make my backs out of leftovers from the front and things from my stash. It makes for some really pretty backs. Here is one of my recent backs. Great way to use up the stash. I' afraid to look at it that closley. I love scraps and plan one day to start making crazy quilts and string quilts. I have a lot of UFO"s and will be retiring soon so I plan to make that my first pitory, finishing some of those. Wish me uck. I tried doing a very little bit of stash-building my first quilting year but I haven't used the fabric and I no longer buy anything until I am starting a project. I have done maybe 16 projects now and I have saved all the leftover fabric. Sometimes I have a lot of leftover because I am not sure how I will use each fabric in the quilt and I buy to have enough. Sometimes leftovers from another project can go into a new project but mainly it is piling up, and I am going to have to get seriously scrappy!